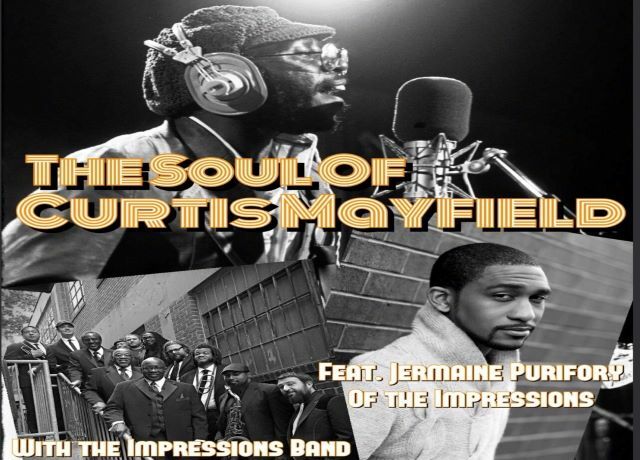 On the eve of the late Curtis Mayfield's 77th birthday, we pay tribute to the legendary singer and songwriter with an all-star performance of his classic soul music! This special concert features the talented Jermaine Purifory, an American Idol standout who was the last lead singer for The Impressions during farewell tours in England and Japan before their retirement last year. Purifoy is backed by the Impressions outstanding tour band performing Mayfield's most popular songs including "Superfly", "Freddie's Dead", "Pusherman", "Move On Up", "The Makings of You" as well as his greatest hits with The Impressions including “It’s All Right”, “Keep On Pushing”, “People Get Ready", “We’re A Winner”, “Choice Of Colors” and many more!